After a weekend with no whining or complaining from a certain threenager, thanks to my mom, it was so nice to lie outside in the grass and read. I read a little for school and then I read a little for fun…but mostly fun. 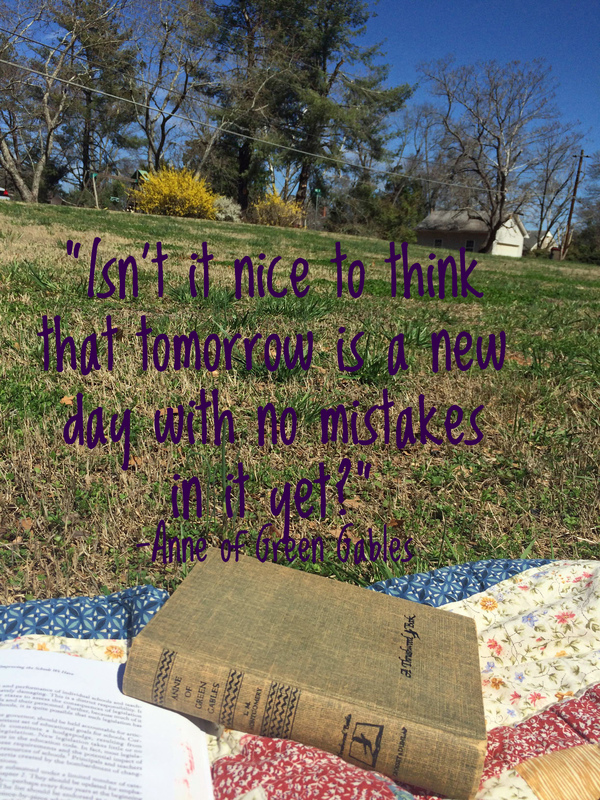 As I started rereading Anne of Green Gables for the second time, I kept getting distracted by how beautiful of a day it was. How important is it that we take time for ourselves? I find myself distracted wasting time on insignificant things and not enough time investing in myself. I have a list of books in my head I would like to read in my lifetime but I tend to find myself coming back to the same old friends I have had read and reread. One of the things I would like to do with this blog is to document all the books I plan to read over the next few years. Maybe next Sunday Funday I will get that list on paper and spend some time with my nose in a new book instead of on Pinterest pinning recipes I will never cook.